Summer is officially here! With all the sun and fun outdoor activities summer brings, it also brings heat and humidity. Even if I wanted to have sleek straight hair, it is virtually impossible to keep it that way for more than five minutes. Since I just can’t be bothered to put much effort into my hair when it is sweltering outside, my go to hair routine for the hot summer months is the effortless wavy hair. 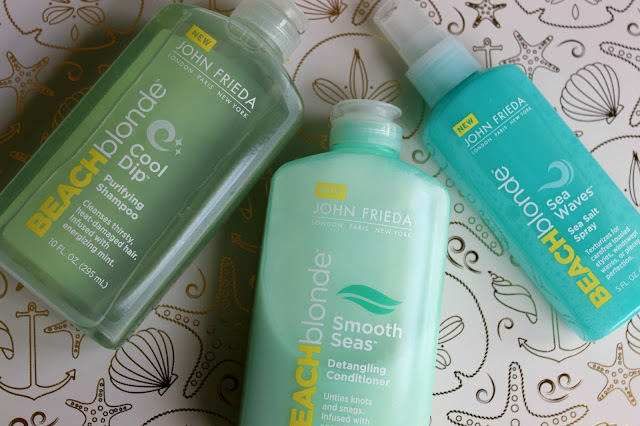 Recently I picked up the John Frieda Beach Blonde range after hearing I Covet Thee rave about the line in her April Favorites. Ulta had the line in stock for about $10 for each item. Later I noticed that Target also carries the range for about $2 less. Don’t you hate it when that happens?! Learn from my impulsive mistake and get it at Target if you can! The Purifying Shampoo and Detangling Conditioner do a great job at cleansing the hair and encouraging my natural waves to be a bit bouncier. The shampoo does a great job at cleaning my hair without it being too drying. The conditioner is lightweight yet works well to keep tangles at bay. To help the conditioner sink into the hair, I squeeze out all the extra water from my hair after I rinse out the shampoo. Then I put in the conditioner concentrating on the ends and let in sink in for a few minutes before rinsing. Both the shampoo and conditioner have a mint scent that is refreshing and not too intense in the shower. After towel drying my hair and letting it air dry for a few minutes, I use the Sea Waves Sea Salt Spray. This product is the real star of the show! It umps up the intensity of my waves without being crispy or heavy. It is seriously awesome! The sent is a little beachier than the shampoo and conditioner but I don’t mind it at all. Not only does this stuff work well but it smells awesome too. Double win! If I want to have a real effortless laid back look, I will just let my hair air dry. However, if I want something a bit more polished for work, I put my hair up into two buns on either side of my head when my hair is almost dry. It looks absolutely ridiculous but the end result is gorgeous loose heatless curls with tons of volume. I learned this trick from Anna Lee and you can check out her tutorial here. I have fallen in love with the Beach Blonde range and it has become my go to for beachy waves. If you can, I would definitely try it out! What products do you love to use for beachy waves? I love beach waves in the Summer time but if I can't get myself to the beach for that authentic look, I love to make my own sea salt spray with distilled water and salt! It makes my hair look like I've just spent a day at the beach! Thanks for the tip Anjelique!